In early March, publisher Barbara Moser and editor Hayley Juhl visited Jukebox Burgers in Marché de l’Ouest. These are their stories. I love those “create your own hamburger restos” in L.A. and New York, the ones that include veggie burgers as choices, so it was with a deliberately empty stomach and a lot of excitement that I drove to Jukebox at the Marché de l’Ouest with fellow editor Hayley on a Friday afternoon. 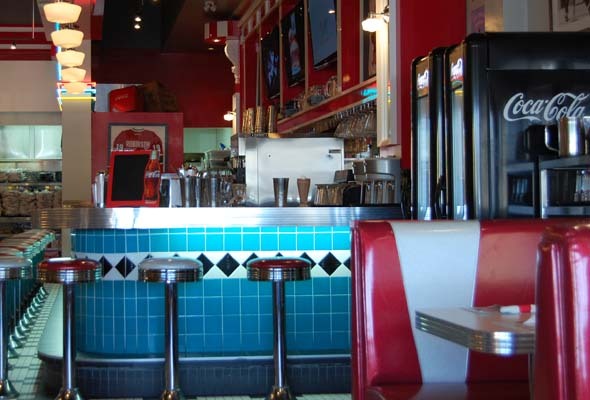 Jukebox gets its name from the retro decor, including half an old red car sticking out of one wall and a huge open space filled with red and white striped booths and tables and an old-fashioned soda fountain. 1. Choose your patty: easy for a vegetarian. 2. Choose your bun: rye! 3. Choose a name (burger toppings). I chose the Buddy Holly ($15.95) with brie and huge slabs of Portobello mushroom on a bed of arugula, with fresh tomato and mayo. 4. Choose your side from mashed potatoes or coleslaw and freshly cut fries. Since Hayley chose the sweet potato fries, I went for coleslaw so we could share. There’s no extra charge for sharing, as long as you can agree on the bun, patty, toppings and side. Not that easy. My burger was all I have been looking for (my whole life! ), piled high with veggies, cheese and the succulent and tender burger, made from soy protein and tasting very much like meat. I dipped Hayley’s crisper than crisp fries into my side of spicy mayonnaise while sipping homemade lemonade, just tart enough to quench my thirst. I loved soda fountains as a child, so when I return (and I will), I’m planning on sitting at the fountain, ordering a strawberry soda and creating my own salad, ($10.95) another of my American-resto favorites. I’m not a child of the soda-fountain ’50s, but I am a child of the Happy Days-era 1970s. I blame that for my love of diners. 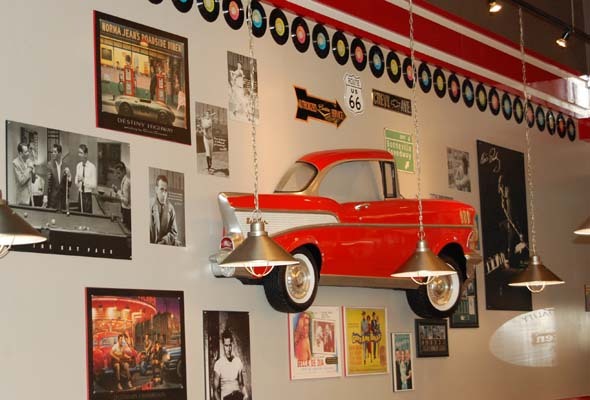 You can find Elvis, Smokey Robinson and Buddy Holly at D.D.O.’s Jukebox. These and other celebrity-monikered burgers—fancy a basket of Brando?—in half- or quarter-pound servings are presented on baked-in-house buns with your choice of side. I chose sweet potato fries ($2 extra) to go with my Sweet Heat ($16.95), which was piled high with caramelized onions, jalapenos and Brie on a thin layer of spicy mayonnaise. The cherry on top (literally) was a classic strawberry milkshake (5.95). All was delivered quickly and cheerily by the friendly Vanessa (who wasn’t wearing roller skates). If you still have room but can’t choose from Jukebox’s extensive dessert menu, stick with the theme and order apple pie or a banana split. I’ve never eaten in the 1950s, but if the food looked and tasted like this … send me back in time. 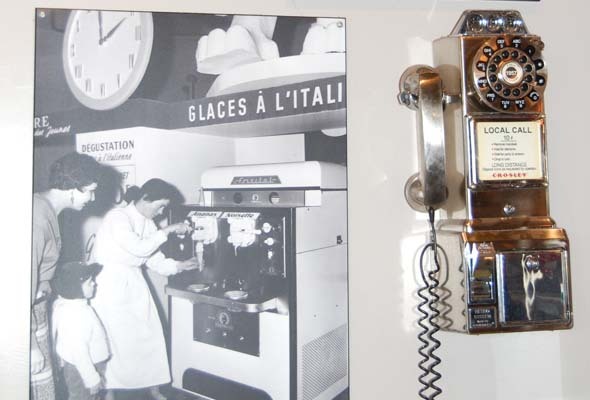 Editor’s Note from Barbara: I have eaten in the ’50s, and it never tasted like this. Jukebox Burgers & Bar Laitier, 11978 de Salaberry, D.D.O. Sun.-Thurs. 11 am-10 pm; Fri.-Sat. 11 am-11 pm. 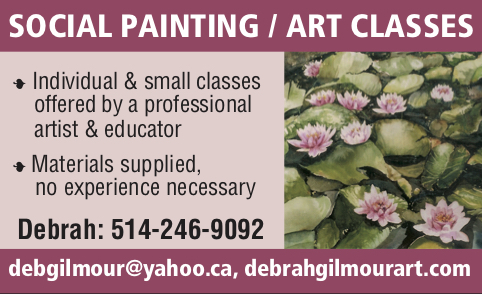 514-542-3222. Be the first to comment on "Restaurant review: Jukebox Burgers & Bar Laitier"